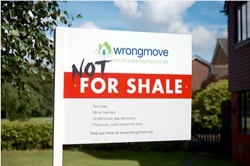 We believe that the Community Benefits scheme for shale gas is shoddily put together, inadequately thought through and shows every sign of being policy made on the hoof. It talks fuzzily of payments to communities without defining what a community is, it talks about making payments to county councils when they are te ones being asked to make decisions on related planning applications and it suggests amounts which would scarcely pay for a 20 MPH scheme in Lancashire, let alone provide any meaningful compensation for the financial loss and loss of amenity that would be suffered if shale gas exploration and production were allowed to go ahead. 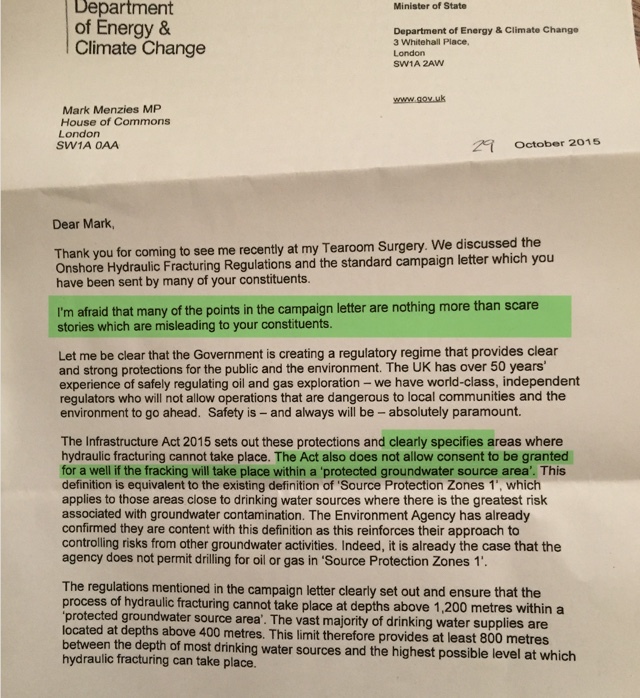 We have asked Mark Menzies MP whether he agrees that there would be a conflict of interest if County Councils both made decisions on planning applications and received funds if, and only, if they were granted. He has not replied. relating to shale gas or fracking during the same period. 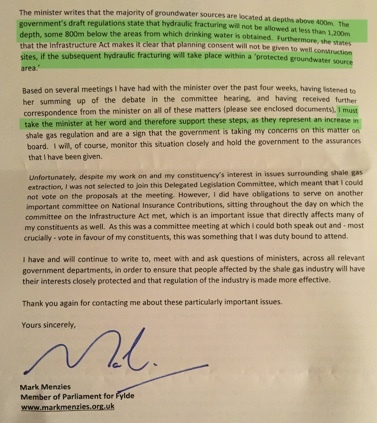 (b) All correspondence between DECC Ministers and the Office of Unconventional Gas and Oil (OUGO) which concern community benefits relating to shale gas or fracking during the same period. 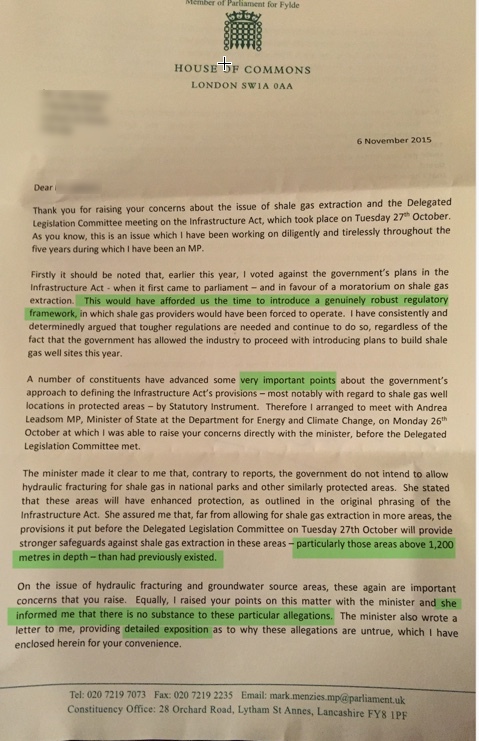 (c) All correspondence between DECC Ministers and Cuadrilla Resources (or associated companies) on the subject of said community benefits during the same period. 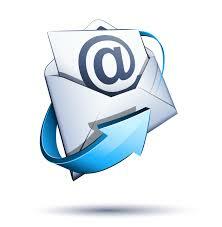 • be provided with that information (subject to any exemptions under the Act which may apply). We can confirm that we hold information in the scope of your questions (a) and (b). Information Act, which provides that information may be exempt from disclosure where it relates to the formulation and development of government policy. The exemption from disclosure under Section 35(1) (a) of the Act is subject to a public interest test. We recognise that there is a general public interest in the disclosure of information, as greater transparency makes government more accountable, and there is a public interest in being able to assess the quality of information and advice given to Ministers, which is used in subsequent policy formulation. However, there is also a public interest in the government making the best possible decisions. Good government depends on good decision-making and this needs to be based on the best advice available and a full consideration of all the options without fear of premature disclosure. As the shale gas industry is at an early stage, policy on community benefits for shale gas is being formulated and reviewed as companies move into exploration and production phases and the industry develops operating experience. The onshore industry launched the Community Engagement Charter on 27 June 2013 and has committed to keeping the Charter and interaction with local communities under review. Industry will be consulting communities on the benefits that will be offered to them, and Ministers will continue to monitor developments in this area. 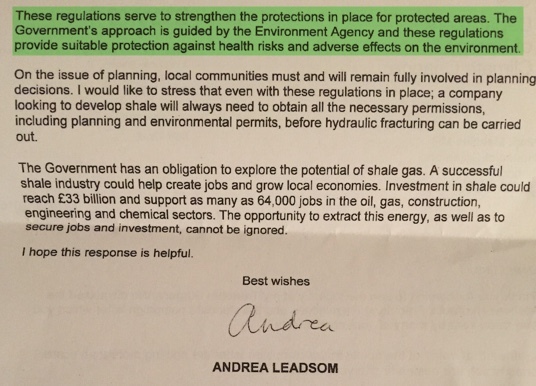 Government policy on community benefits for shale will be formulated and reviewed in light of these developments. We believe that any disclosure of information of the type specified would prejudice the ability of Ministers and officials to conduct rigorous and candid risk assessments of their policies and programmes including considerations of the pros and cons without there being premature disclosure which might close off better options. In our view, the balance of public interest therefore lies in withholding the information you have requested. We can confirm that we do not hold the information requested under (c). We need to be able to see what communication is happening around these community benefits because it is currently being handled in such an obviously incompetent way. The results of disclosure might well be embarrassing but that is surely no reason to refuse the request. Defend Lytham would question many of the assertions made by the Prime Minister in his article. Firstly the suggestion that shale gas will mean any sort of reduction in gas prices has been debunked, not only by bodies like Deustsche Bank, The Committee on Climate Change and Bloomberg Finance, but by Cuadrilla themselves. It seem that the only people who keep perpetuating this myth are those in our government who are trying to make a political case for fracking. 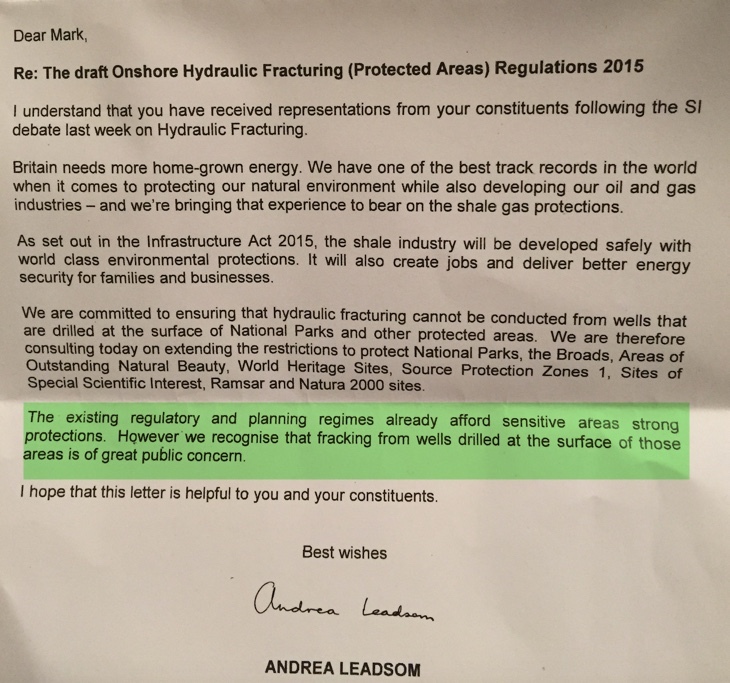 Defend Lytham believes that this suggestion is unhelpful in furthering the debate on fracking. Secondly he suggests that fracking will give us 51 years worth of energy if 10% of the hypothetical reserves could be commercially extracted. This figure is a fine example of the selective use of data. 10% of the BGS estimate is 130 trillion cubic feet (tcf). Average annual gas demand since 2000 has been 3.6 tcf (2). Even allowing the optimistic 10% of the estimated gas in place that would only amount to 36 years. Professor Peter Styles, professor of applied and environmental geophysics at Keele University, who has studied the issue suggests that increased supply would also increase demand and that we should not expect more that 25 years use from 130 tcf (3). To exaggerate the potential by using the lowest figure in the previous 12 years, as Mr Cameron does here, is highly misleading. Defend Lytham believes that a proper assessment of fracking’s potential is necessary if people are to make informed choices. Thirdly he tells us we can expect around 74,000 jobs. This figure cannot be justified. It comes from a report by the Institute of Directors that ignores huge variations in cost structures between countries and makes hugely over-simplistic comparisons as a result. The report’s author refuses to comment on criticisms of his methodology. Defend Lytham believe that an honest assessment of any potential employment gains and losses which might result from fracking is essential to public understanding of this issue. This figure is definitely not the result of such an honest assessment. Turning to Mr Cameron’s exhortation that “I want all parts of our nation to share in the benefits: north or south, Conservative or Labour. We are all in this together. ” Defend Lytham was surprised to read in the Daily Mail that, after saying this, Mr Cameron avoided answering the question of whether he would welcome fracking in his own constituency no less than 10 times (4). It seems that there is no sacrifice so great that the Prime Minister won’t talk about it. Defend Lytham cannot understand how Mr Cameron is able to state that local people will not be “cut out and ignored” as this is precisely the impact that the Government’s new planning guidelines will have, by effectively reducing Lancashire County Council’s role to rubber stamping planning applications. Mr Cameron’s reassurances regarding environmental impact fail to convince. Ignoring the fact that he doesn’t seem to know the difference between a cricket pitch and a cricket field, he claims that “similar types of drilling have been taking place for decades in this country without any real protest”. As a claim that is as disingenuous as the claim made by Cuadrilla last year that their well at Elswick is representative of future fracking developments. That claim was censured by the Advertising Standards Authority for being misleading and an exaggeration. Defend Lytham would remind Mr Cameron and the public that shale gas and fracking is such challenging engineering that 50% wells here have failed and that leading academics are calling for more research to be carried out before further experiments are undertaken. It is simply not sensible to be using the UK population as guinea pigs. Finally he tells us “we cannot afford to miss out on fracking”. Defend Lytham believes that Mr Cameron has failed to make an adequate or convincing case to support that statement. The government today released further details of the most generous tax breaks package in the world, to encourage investment in this financially high risk area. The new shale gas allowance will more than halve the tax due. We are equally concerned that the government has failed to provide details of the new planning guidance which we were assured would be published by yesterday at the latest. A government which ensures that a controversial industry is subsidised before it sorts out the associated planning environment, and which spends more time publicising cash incentives for local communities that it does in ensuring we have effective regulation in place to protect those communities has its priorities very, very wrong. Defend Lytham believes that this subsidy to the fracking industry is totally unnecessary.